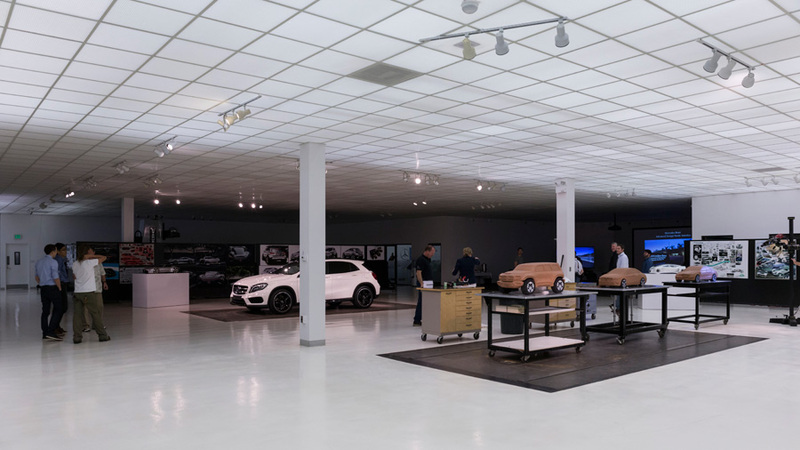 Mercedes-Benz invited us to take their brand spanking new GLA crossover SUV to the Coachella Music & Arts Festival, with a pit stop in their futurist Advanced Design Studio dream factory in Carlsbad, San Diego. This is the story. It’s as if it were on cue. 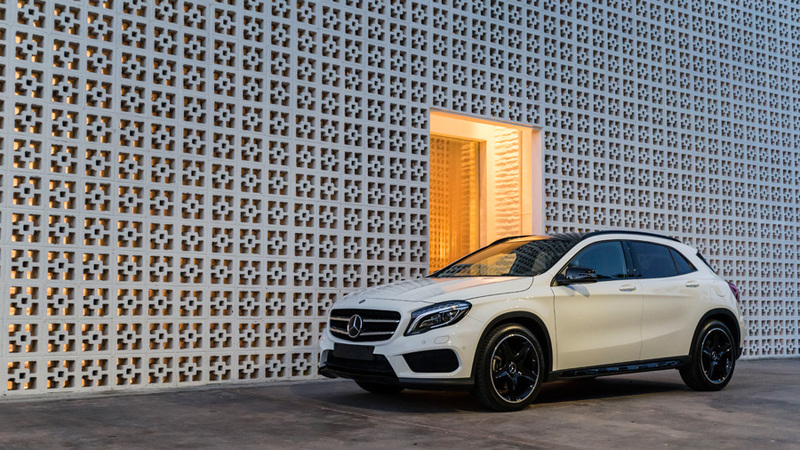 On a bright and beautiful California afternoon a Mercedes-Benz representative stands outside the Shade Hotel, a quaint boutique inn nestled near the heart of Manhattan Beach, gushing enthusiastically about his new automotive progeny: the GLA. The compact SUV, or CUV, sits between us, slick in polished Mountain Grey paint with all its exterior flourishes blacked out, including 19-inch wheels, side view mirrors, B-pillar and rockers, in a package called “Midnight Trim”. The monochromatic hues play off each other with handsome restraint. Around the car a group of lifestyle journalists mill about, half listening, rubbing eyes fatigued from disparate time zones — flown in from the UK, Germany, Hong Kong, Russia, Venice Beach and everywhere in between. Just then, there is a high-pitched squeal. Up the street runs a young woman in Ray-Bans, straw fedora, short shorts and Ugg boots, camera in hand. “Ohmigawdilovethiscar!” she yelps, and bounds in between us all. The professional presentation grinds to a halt as if interrupted by a cameo from a ghost-dancing Lorde, the young lady babbling on about how much she loves the car, its multifaceted adorability, how long she’s been waiting for it, etc, and then asks if we would take her picture with it. Russian journalists stand dumbfounded as this Hollywood casted representative of SoCal breeziness (some might say air-headedness) proceeds to ducklip, smile and bounce, and then gleefully and gratefully bound into a Range Rover that pulls around to pick her up. Like a thirty second Urban Outfitters tornado, here and gone. Merc reps stand speechless. Suddenly, all their talk of Adaptive Cruise Control and Distronic Plus braking fall soundless. In one perky, trendily-dressed interruption Benz’s “Come Out & Play With the GLA” program is rendered moot. 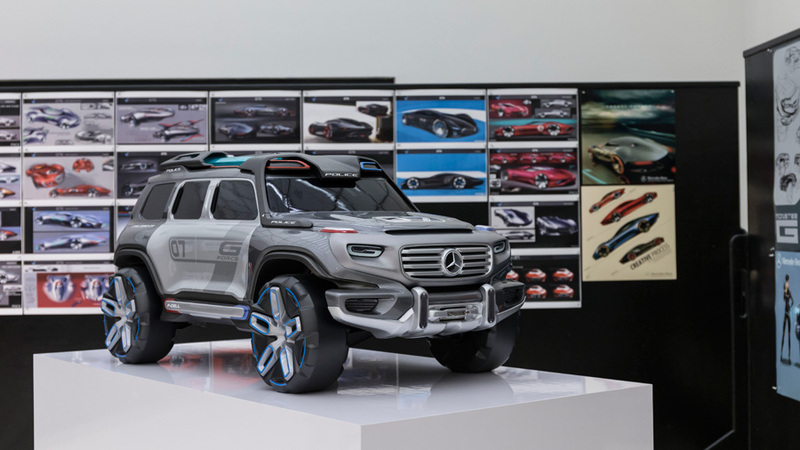 All the Powerpoint presentations and beautifully edited video spots could not explain to these gathered scribes what this single girl did in one iPhone-wielding assault: the GLA is opening Mercedes-Benz up to a whole new world of customer. And like the “four-door coupe” CLA with which the GLA shares its platform, the car will succeed in wooing a new customer heavily based on its looks. While not as striking as the CLA, photos do not quite do the GLA justice — it casts a compelling figure in real life. Which is saying something, given it resides in what is one of the most asexual, staid body types in the automotive kingdom. The crossover segment may be red hot in sales, but hardly in the smiting department — consider the segment includes such loin-warming stunners as the Honda CR-V, Subaru Forester, Nissan Rogue and Kia Sorento. Size-wise, the GLA fits between those mass sellers and others like the Kia Soul, Mini Countryman and Buick Enclave. Still, those are all cars you can send your girlfriend out in without worry; no one will be looking twice. Benz, however, does a lot with what it has. 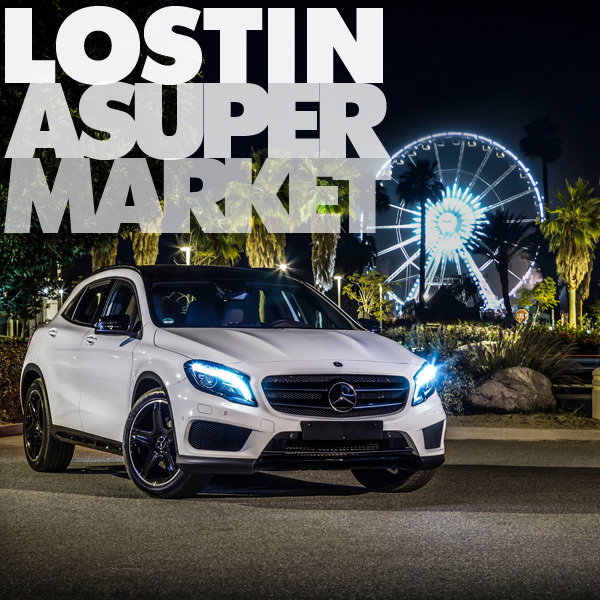 Built like a slightly raised, slightly fattened CLA, the GLA loses its brethren’s leading man looks and taut driving dynamics in favor of higher ground clearance (76 mms higher), softer ride, better visibility and all around easier drivability. Depending on what you’re looking for, this can either be a bad or good thing. Its sheet metal is crisp, highlighted by power domes on the hood and integrated roof racks. Bi-Xenon headlamps, daytime running lights and sculpted, jewel-like taillights are standard. 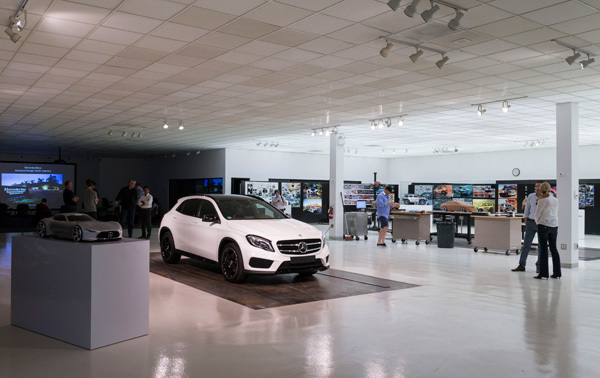 For this particular “Come Out & Play” program Benz loaded up two dozen journos — covering everything from fashion and food to tech and sneakers — and let us drive their new GLA from sunny Manhattan Beach to Benz’s illustrious Advanced Design Studio in north San Diego County. 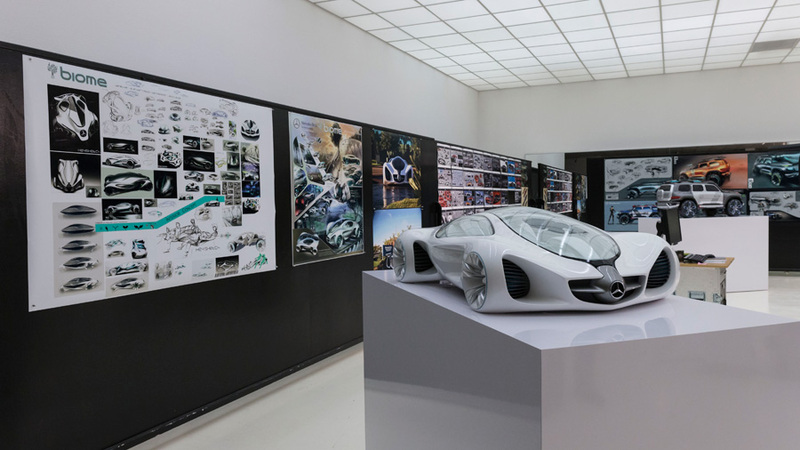 In that high security futurist complex Benz designers have crafted everything from the liquid silver AMG Vision (unlocked in the latest version of Gran Turismo) to the Ener-G-Force wagon to the Biome Concept — a biodegradable vehicle that is not manufactured, but rather (theoretically) grown in a nursery. 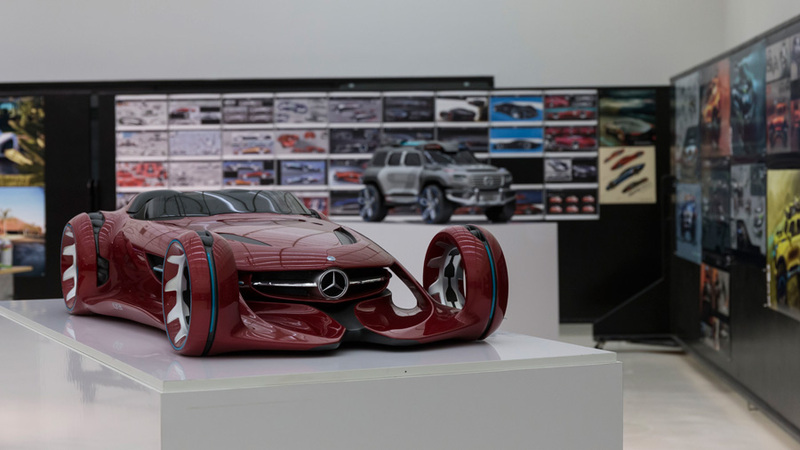 Dazzling scale concepts, clay models and sketches were scattered across the bright white showroom like gems in a dragon’s den. Some seemingly dusty and forgotten, some protected and lorded over like the Arkenstone. 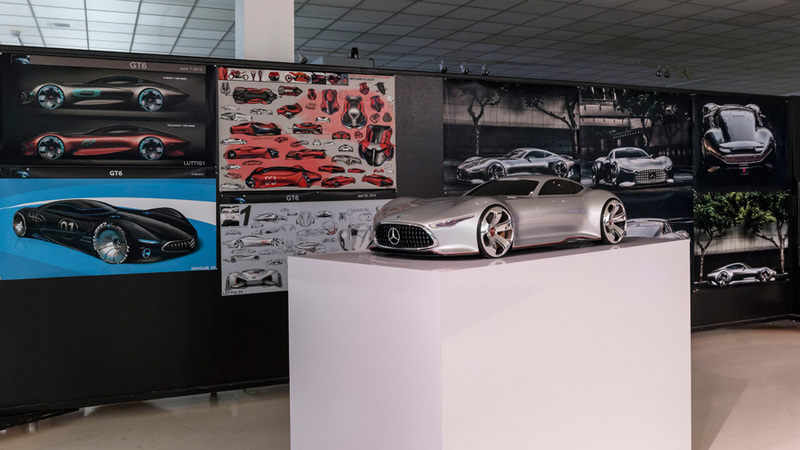 But it wasn’t just cars that gleamed in that cube of future-forward design — Formitalia furniture, an Airbus helicopter and TWC luggage collaborations were also offspring of the Mercedes-Benz Style division. But while pondering Blue Sky concepts and eating impeccably prepared short rib chow mein was nice and all, it was the next leg of the program that had us all salivating. 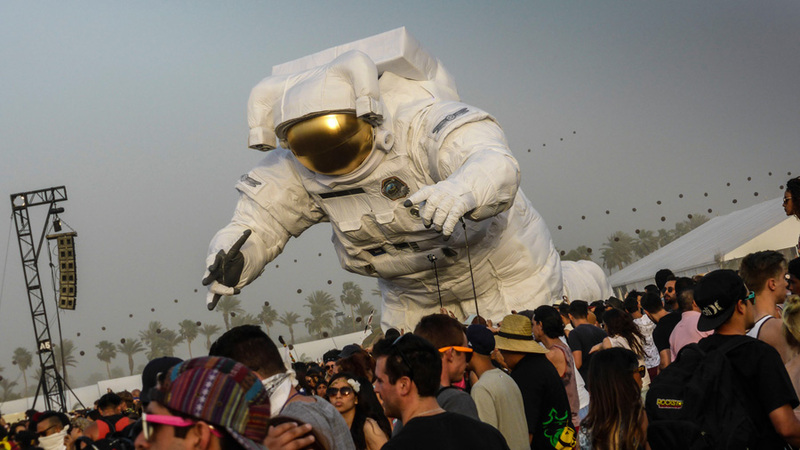 We were all eager to leave Benz’s ADS simply because our next destination in the “Come Out & Play” program was the verdant polo fields of the Coachella Music Festival. So we loaded up once again into the GLAs and aimed the Tristars on their hoods towards the San Jacinto Mountains. Quickly we left the other more tepid Euro drivers in our wake, impatient to test the GLA’s mettle on the curvy switchbacks that would define the next several hours of driving. Surprisingly, given the GLA’s raised profile and slightly paunchier build, the vehicle handled these driving conditions well. 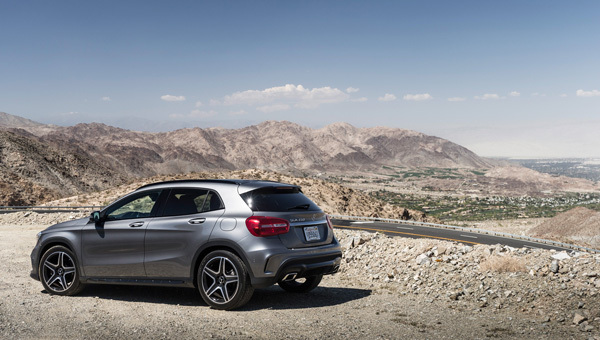 While we got some good seat time during the first leg of the trip, sweeping through the Pacific Coast Highway curves that run along Seal and Huntington Beaches, this leg challenged the GLA. The turbocharged 2-liter’s 208 horsepower is adept even at these higher elevations, and given you can pull all 258 lb-ft of torque at only 1200 rpms, you won’t be waiting all day for the turbo to spool up. Its standard double-clutch actuated seven-speed automatic is smooth, making crisp downshifts when you’re setting yourself up to pass desert-living bumpkins. And Benz’s 4MATIC AWD setup, also plucked from the CLA, can send power to all four wheels to assure nice mid-corner grip (in natural cruising mode the car heavily favors the front axel). 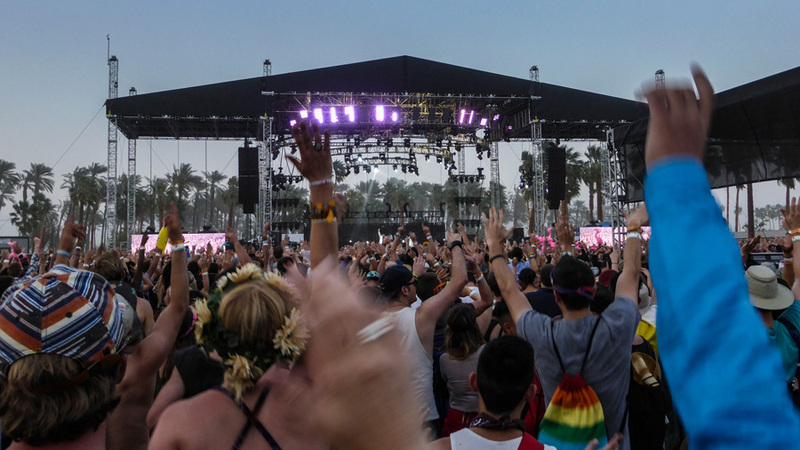 Through it all, the optional 450-watt Harman Kardon amplifier and 12 high performance speakers will have you pumping your fists, loving every minute of your Coachella Warm-Up Mixtape as Empire Of the Sun reminds you how good it feels to be alive. 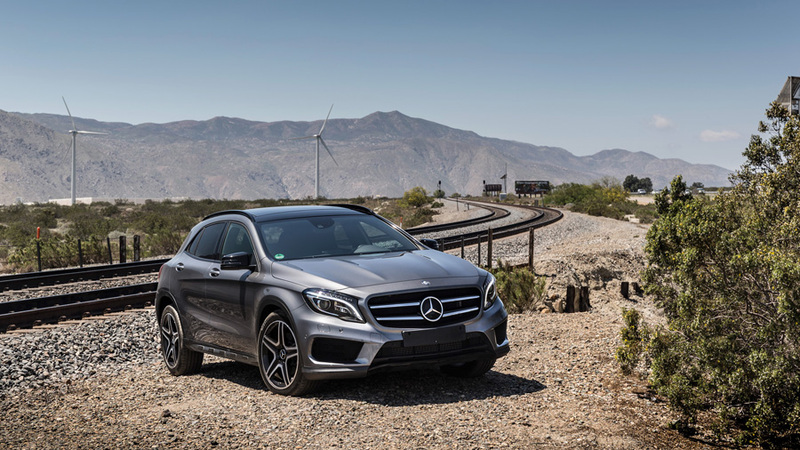 It should be noted that Benz stresses the GLA is a “true SUV”, as credibility builders like hill descent will be standard on all AWD models (a cheaper front-wheel drive model will be available in early 2015). The heavily flared wheel arches, wide rear haunches and extra cladding hint at its off-road capability, and its profile — wedged belt line, long front overhang, short rear overhang — makes the GLA look like its perpetually lunging forward, athletic, moving in stasis. Combine that with the surprising torque and raised suspension, and the muscular crossover should be able to handle light off-road duties. But let’s be honest — as long as the GLA can overcome the potholes of the East Village, it will have done its job better than tackling the Rubicon. Soon we crested the Cahuilla Tewanet Vista Point on the Pines-to-Palms Highway and looked down at the entirety of the Coachella Valley spreading out before us into the ochre desert. To the west, the sun was bleeding orange as it dipped into the Pacific. 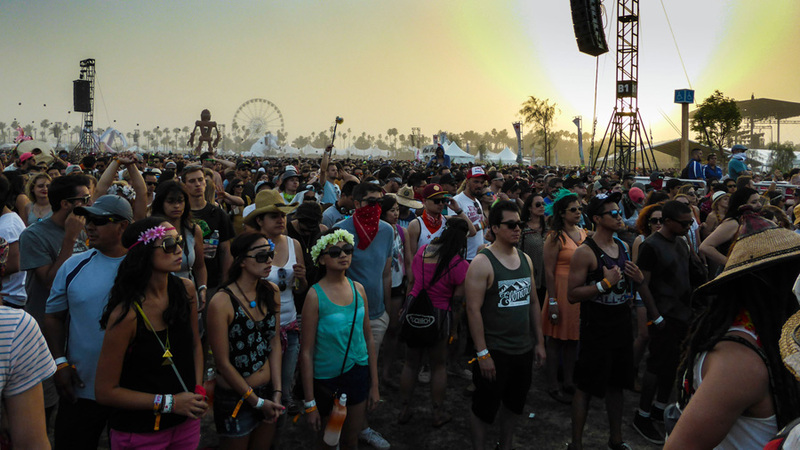 To our right, some dozens of miles down, 100,000 music fans were simmering their juices as Ellie Goulding hit the main stage. And directly ahead, in the flower-blooming center of Palm Springs, our destination — the sprawling Parker Hotel — awaited with open arms (and chilled mojitos). All was right in the world. 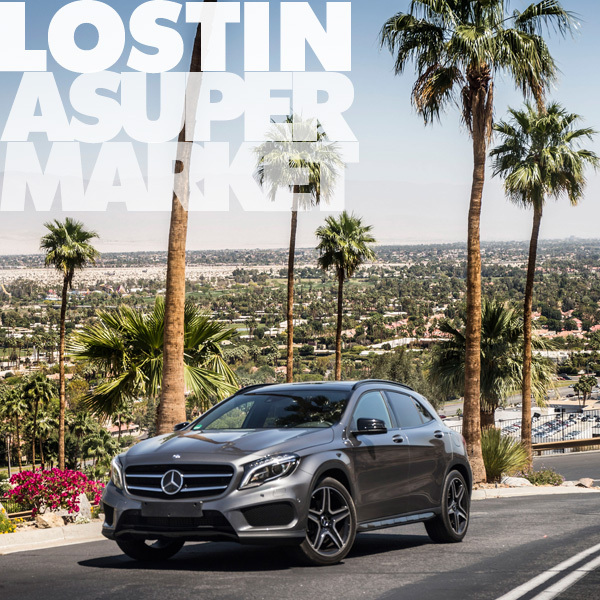 So we revved the throttle and aimed downhill — down into the heart of the Desert Cities, into the peak of the Coachella madness, and into the last wisps of playtime with the GLA.